For the last couple of years renowned freerider Kyle Jameson has made Oregon his home. When good friend and legendary filmmaker Clay Porter and the Metis Creative crew relocated north, it was the perfect opportunity to collaborate on this project. Kyle's aggressive but smooth style is showcased in this piece, alongside his effortless ability to tear-up the steep loose tracks in Oregon. The best part is when the Slowmo and the electro stops... and the shred begin ! sick riding and editing i got trolled by the beginning ! But hey I'm kyle j.
I like to party on the trails! Heck yeah man! I absolutely love the inside live podcast and that was an awesome one. Spomer really does great with those. Welcome to Oregon Kyle Jameson! This doesn't look at all like any of the lift-served bike trails on Mt. Bachelor. the only reason to own a downhill bike in bend is cline and the ODP fest jumps. most of oregon really. RIP Willamette pass. @mustbike: The most part, I agree. Bend and surrounding area is perfect for 6 inch trail bike. I'm going to build up a basic DH bike this summer as a Bachelor, Ski Bowl, Whistler bike. @mustbike: Cline is sweet but do they actually even let people ride the ODP jumps? @ryane: ski bowl you def need a dh whip haha. I was super disappointed when I went to bach. @mustbike: you like skibowl over bachelor? I wanna make a trip when the snow melts but skibowl is actually really close to me. Kyle scared the trail into submission with his vicious stare down. First minute of this video blows... annoying graphics, stupid slo-mo, and unnecessary skids. But after that 1 minute... dude has skills. He rips. Bend, OR FTW! Yeah I barely hung on through that horrible first part but then after 1:15 it paid off. I have never seen a video that gives such an impression of speed. Kyle is tearing that place apart! And the drifts! Hats off to skill like that! Yeah, 3 minutes of shredding, 3 days of trail work. Mad skills but I wish he didn't destroy the trail so much. He should be allowed to do it, but nobody else. All I saw was slo-mo and skids. @Yaan: for real, that’s the only good thing about slo-mo. You can see who the brake draggers are. But... but... that's not bachelor. At all. Also, bachelor isn't steep. It's mt flat-chelor for a reason. That aside, this was sick. Kaje is the man. Rockfall @ Bachelor would disagree! @ryane: doesn't look like any bit of rock fall I've ridden. But I also just close my eyes, point it down, and pucker and pray. @hashtagendurotodd: Ya Rockfall is all rock plus massive amounts of volcanic moon dust. This vid was definitely not on the main runs. @ryane: confirmed by my buddies who were the filming, it's Ashland, in southern Oregon. @ryane: rockfall isnt steep at all, it should be a black diamond not a double. bachelor will have a new jumpline in june REDLINE. @hashtagendurotodd: no way, unless it's backside trails on mt A. Or offshoot actually, theres moon dust up there. @mustbike: so, you're telling me the guy who shot it didn't know where he's at? It’s definitely flat, out in Bend. I live in bend and know all the trails, even the illegal ones. This isn’t one of them. Bend doesn’t have steeps. Kind of weird to film it elsewhere and claim its bend. Wow... Your ego is out of hand. I seriously doubt you know ALL the trails. Sweet flow trail, that dirt is miles better than the dust on Bachelor. Why DH bike? This isn't bachelor lift served. Beautiful edit and just awesome riding and skids. Loved how the music stopped and it was pure shred. Pine mountain sports in Bend for bike rentals is your best bet. Loved that ending, with the horror-movie like crackling sounds, images, and cuts. Awesome Kyle; nice work. You make that speed look easy. If you live out of the area and this video inspires you to visit any area in Oregon, please don’t ride like this. Hey KJ- hit me up and drive over 126. I bet you a 6 pack you'll be surprised. That was SICK, beautiful edit, make us wanna shred too!! Yeah boys. Conditions looked prime! Its refreshing to see local pnw downhill bike coverage. I'm over the taken over enduro trail bike pnw scene. Dude was ridin' from bigfoot...! Fast as hell! I Liked the film making, but..: why riding a DH bike on such trail ? 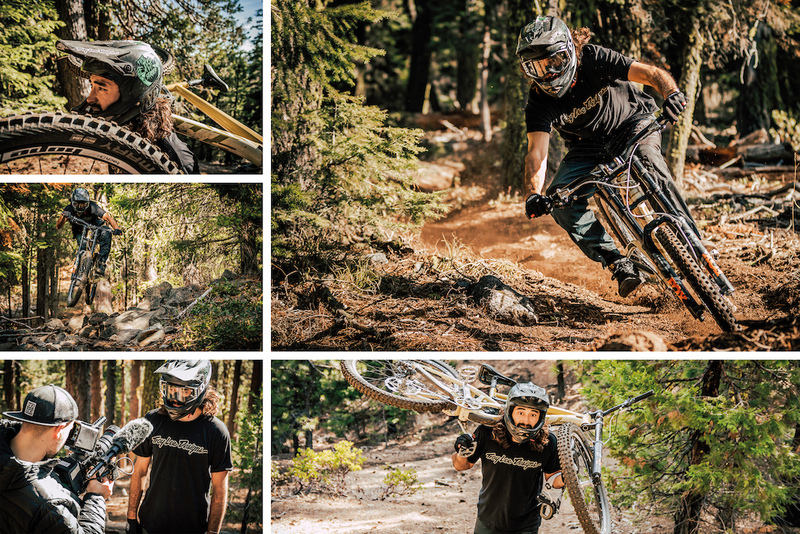 Because DH bikes are fun and KJ is rad and can do whatever he likes. Love this place. Can’t wait to move!!!! @hashtagendurotodd: lol they let you in... I’m sure there is room for one more. @olddude: lol bet the bike shop he works at wants more riders up there. @krumpdancer101: No, probably not. Neither do I ............ I just think, if you aren’t from Oregon, you don’t have the right to tell other people to not move here. @hashtagendurotodd: 15 years?? Where before that?? @olddude: Thank you for the perfect response to the typical transplant who thinks he's "earned" some local status because of his "15 years" in Bend! Bravo! Don't listen to any haters in Bend. Most people in Bend are transplants anyway... Do what you want to do. Move to Oregon and enjoy yourself. It is truly wonderful here and most people are welcoming and friendly. @MtHood-G: signed my contract for my house today!!!! Will be built by June. @krumpdancer101: Good for you! You will enjoy Bend. It really is a great place and has so much to offer all year long. Who invented the freeride flick and how do we go back in time to stop it. My guess is Richie Schley?? Seriously freeride flicks are lame.